韩召强, 陈效民, 曲成闯, 张晓玲, 张俊, 黄春燕, 刘云梅. 生物质炭对黄瓜连作土壤理化性状、酶活性及土壤质量的持续效应[J]. 植物营养与肥料学报, 2018, 24(5): 1227-1236. HAN Zhao-qiang, CHEN Xiao-min, QU Cheng-chuang, ZHANG Xiao-ling, ZHANG jun, HUANG Chun-yan, LIU Yun-mei. Sustained effects of biochar application on physico-chemical properties, enzyme activities and quality of soil with continuous planting of cucumber[J]. Journal of Plant Nutrition and Fertilizers, 2018, 24(5): 1227-1236. Abstract: 【Objectives】 This study investigated the sustained effects of biochar application on properties of root zone soil continuously planted with cucumber, providing scientific evidences for biochar remediation of continuous cucumber planting soil and widely use in agriculture. 【Methods】 A greenhouse experiment was conducted at Rugao Institute of Agricultural Science, Jiangsu province. 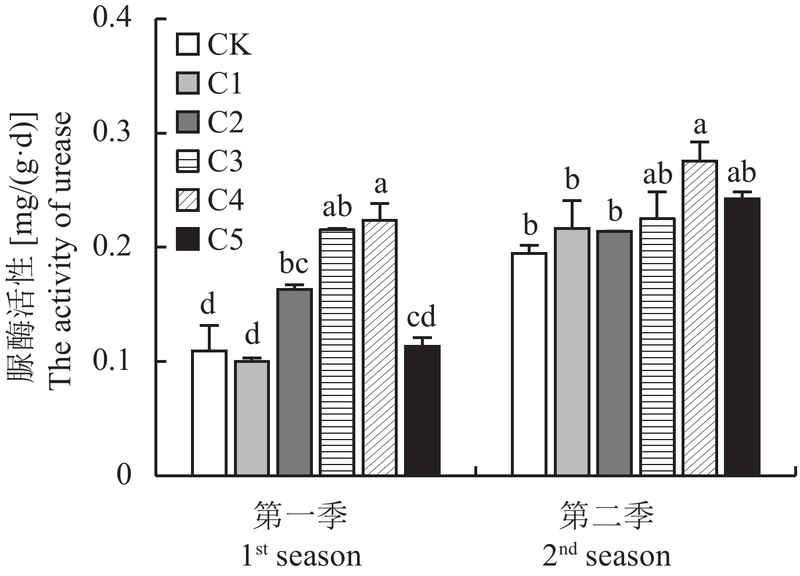 Biochar was applied only once at rates of 0, 5, 10, 20, 30, and 40 t/hm2, denoted as CK, C1, C2, C3, C4 and C5, respectively, and physical properties, nutrient contents and enzyme activities of root zone soils continuously planted with cucumber were analyzed in two consecutive years. The soil quality index (SQI) was used to evaluate the impact of different rates of biochar on quality of soil continuously planted with cucumber. 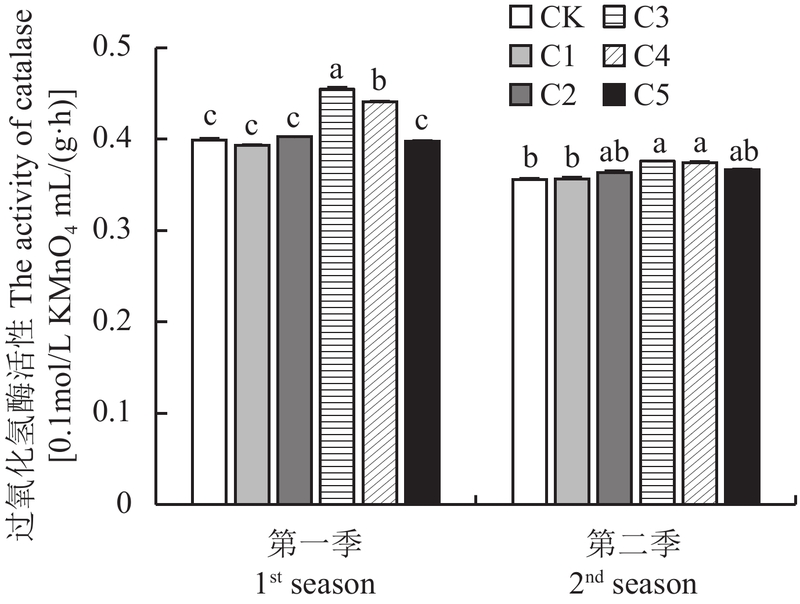 【Results】 The changes of soil physico-chemical properties with different rates of biochar in the first season were consistent with that in the second season. Biochar application reduced the soil bulk density, while increased the soil porosity, saturated water content, field moisture capacity, saturated hydraulic conductivity, available phosphorus and organic matter content, compared with the control without biochar application. 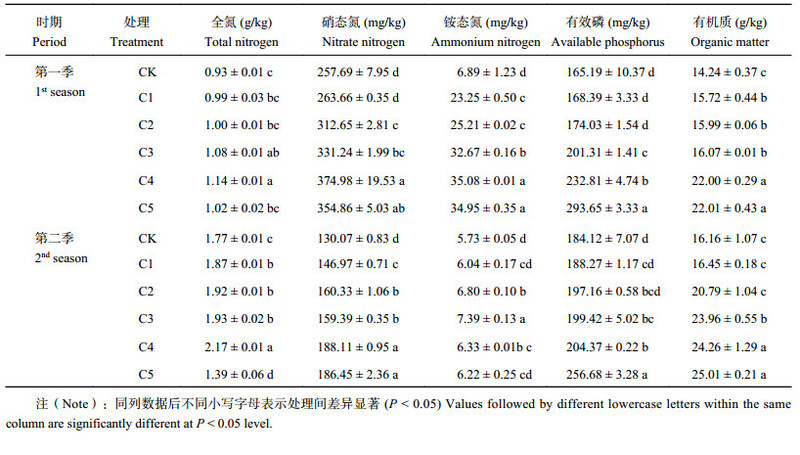 The contents of total nitrogen, nitrate nitrogen and ammonium nitrogen were greatest when biochar was applied at 30 t/hm2. Compared with the control, biochar application reduced the mass content of < 0.25 mm soil aggregates, while increased the content of > 0.25 mm soil aggregates. The contents of 0.25–0.5 mm and 0.5–1 mm soil aggregates were greatest when biochar was applied at 40 t/hm 2. soil urease and catalase activity was greatest at biochar rates of 30 t/hm2 and 20 t/hm2, respectively, and showed the same trend of increasing at first and then decreased with increase rate of biochar in consecutive two cropping seasons. 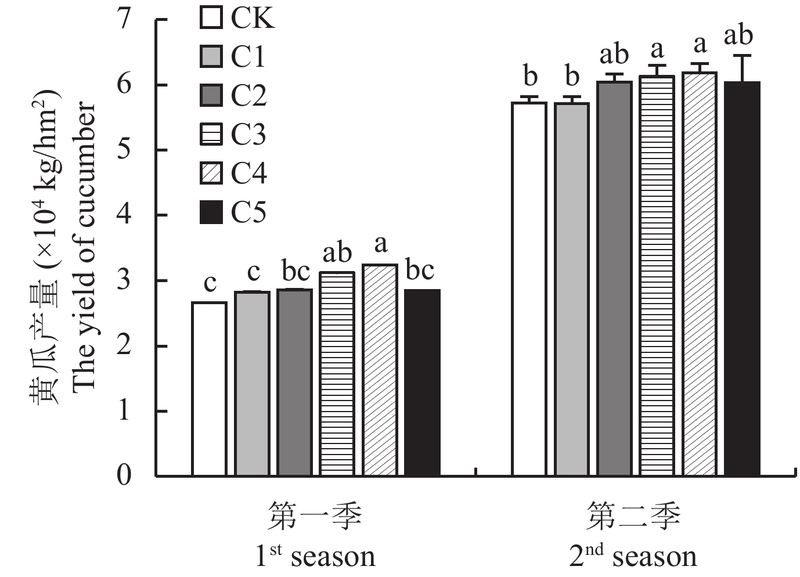 Cucumber yield in first and second seasons was 3.24 × 104 kg/hm2 and 6.18 × 104 kg/hm2, respectively, and was highest when biochar was applied at 30 t/hm2. 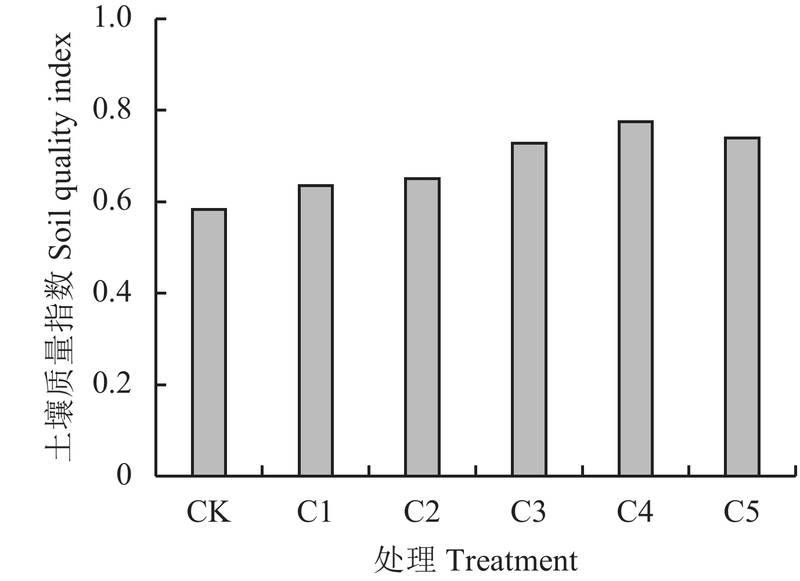 The analysis of SQI indicated that soil quality change in the order of C4 > C5 > C3 > C2 > C1 > CK. 【Conclusions】 The physico-chemical properties and enzymatic activities of the continuous cucumber cropping soil were significantly affected by biochar application. The optimal application rate of biochar was 40 t/hm2 and 30 t/hm2, respectively for soil physico-chemical properties and nutrient contents. The SQI can be used to clearly evaluate the effect of biochar application on continuous cucumber cropping soil. Biochar at 30 t/hm2 was optimal in improving the properties of continuous cucumber cropping soil. 注（Note）：同列数据后不同小写字母表示处理间差异显著 (P < 0.05) Values followed by different lowercase letters within the same column are significantly different at P < 0.05 level. Li N, Li H, Zhu F, et al. Relationships between soil microbial ecological characteristics and physical-chemical properties of vegetable garden soil[J]. Chinese Journal of Applied Ecology, 2006, 17(2): 285. 吴凤芝, 赵凤艳, 刘元英. 设施蔬菜连作障碍原因综合分析与防治措施[J]. 东北农业大学学报, 2000, 31(3): 241–247. 孙光闻, 陈日远, 刘厚诚. 设施蔬菜连作障碍原因及防治措施[J]. 农业工程学报, 2005, 21(14): 184–188. 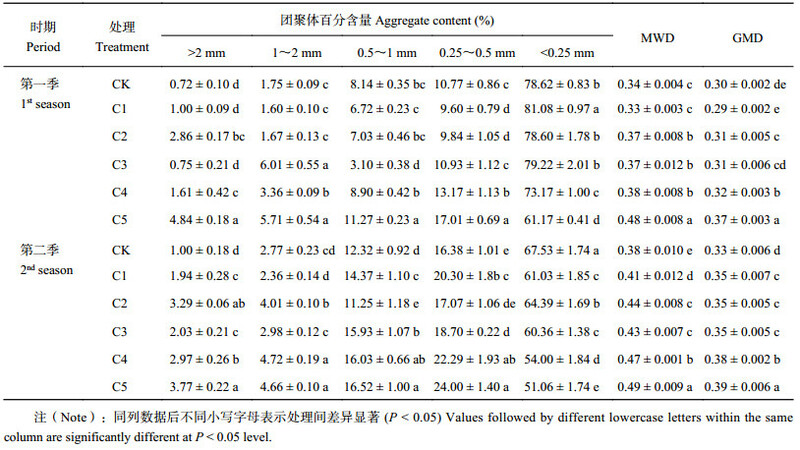 Sun G W, Chen R Y, Liu H C. Causes and control measures for continuous cropping obstacles in protected vegetable cultivation[J]. Transactions of the Chinese Society of Agricultural Engineering, 2005, 21(14): 184–188. 刘荣乐, 金继运, 吴荣贵, 等. 我国北方土壤−作物系统内钾素循环特征及秸秆还田与施钾肥的影响[J]. 植物营养与肥料学报, 2000, 6(2): 123–132. 王小彬, 蔡典雄, 张镜清, 等. 旱地玉米秸秆还田对土壤肥力的影响[J]. 中国农业科学, 2000, 33(4): 54–61. 花莉, 张成, 马宏瑞, 等. 秸秆生物质炭土地利用的环境效益研究[J]. 生态环境学报, 2010, 19(10): 2489–2492. 章明奎, Bayou W D, 唐红娟. 生物质炭对土壤有机质活性的影响[J]. 水土保持学报, 2012, 26(2): 127–131. Zhang M K, Bayou W D, Tang H J. Effects of biochar's application on active organic carbon fractions in soil[J]. Journal of Soil and Water Conservation, 2012, 26(2): 127–131. 白冰, 陈效民, 秦淑平. 黄河三角洲滨海盐渍土饱和导水率的研究[J]. 土壤通报, 2005, 36(3): 321–323. 鲍士旦. 土壤农化分析[M]. 北京: 中国农业出版社, 1999. Bao S D. Soil and agricultural chemistry analysis [M]. Beijing: China Agriculture Press, 1999. 关松荫. 土壤酶及其研究法[M]. 北京: 农业出版社, 1986. Guan S Y. Soil enzymes and their research methods[M]. Beijing: Agriculture Press, 1986. 姚荣江, 杨劲松, 陈小兵, 等. 苏北海涂围垦区土壤质量模糊综合评价[J]. 中国农业科学, 2009, 42(6): 2019–2027. 杨建军. 甘肃中部日光温室土壤质量研究[D]. 兰州: 甘肃农业大学硕士学位论文, 2012. Yang J J. 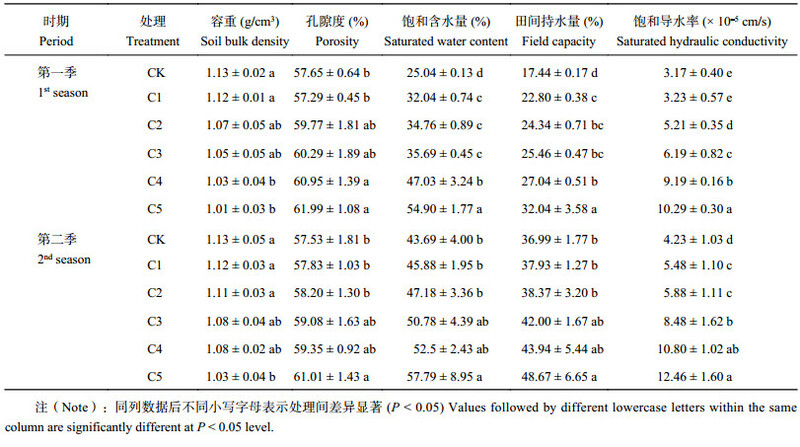 Study on soil quality of greenhouse in central Gansu [D]. Lanzhou: MS Thesis of Gansu Agricultural University, 2012. 张汪寿, 李晓秀, 黄文江, 等. 不同土地利用条件下土壤质量综合评价方法[J]. 农业工程学报, 2010, 26(12): 311–318. Herath H M S K, Camps-Arbestain M, Hedley M. Effect of biochar on soil physical properties in two contrasting soils: An Alfisol and an Andisol [J]. Geoderma, 2013, 209-210: 188–197. Piccolo A, Pietramellara G, Mbagwu J S C. Use of humic substances as soil conditioners to increase aggregate stability[J]. Geoderma, 1997, 75(3): 267–277. 陶朋闯, 陈效民, 靳泽文, 等. 生物质炭与氮肥配施对旱地红壤微生物量碳、氮和碳氮比的影响[J]. 水土保持学报, 2016, 30(1): 231–235. Tao P C, Chen X M, Jin Z W, et al. Effects of biochar combined with nitrogen fertilizers on microbial biomass C,N and carbon-to-nitrogen ratio of upland red soil[J]. Journal of Soil and Water Conservation, 2016, 30(1): 231–235. 张伟明. 生物炭的理化性质及其在作物生产上的应用[D]. 沈阳: 沈阳农业大学博士学位论文, 2012. Zhang W M. Physical and chemical properties of biochar and its application in crop production[D]. Shenyang: PhD Dissertation of Shenyang Agricultural University, 2012. 靖彦, 陈效民, 李秋霞, 等. 生物质炭对红壤中硝态氮和铵态氮的影响[J]. 水土保持学报, 2013, 27(6): 265–269. 花莉, 金素素, 洛晶晶. 生物质炭输入对土壤微域特征及土壤腐殖质的作用效应研究[J]. 生态环境学报, 2012, (11): 1795–1799. Guo Y, Li L, Wei C, et al. Effect of nitrogen fertilizer on biomass amount and soil enzymes activity of desert grassland in Xinjiang[J]. Transactions of the Chinese Society of Agricultural Engineering, 2011, 27(13): 249–256. Xiao X, Zhu W, Xiao L, et al. Suitable water and nitrogen treatment improves soil microbial biomass carbon and nitrogen and enzyme activities of paddy field[J]. Transactions of the Chinese Society of Agricultural Engineering, 2013, 29(21): 91–98. 周礼恺, 张志明, 陈恩凤. 黑土的酶活性[J]. 土壤学报, 1981, (2): 158–166. Zhou L K, Zhang Z M, Chen E F. Enzymatic activities in black soils[J]. Acta Pedologica Sinica, 1981, (2): 158–166. 郭天财, 宋晓, 马冬云, 等. 施氮量对冬小麦根际土壤酶活性的影响[J]. 应用生态学报, 2008, 19(1): 110–114. Guo T C, Song X, Ma D Y, et al. Effects of nitrogen application rate on soil enzyme activities in wheat rhizosphere[J]. Chinese Journal of Applied Ecology, 2008, 19(1): 110–114. 朱美玲, 贡璐, 张龙龙. 塔里木河上游典型绿洲土壤酶活性与环境因子相关分析[J]. 环境科学, 2015, 36(7): 2678–2685. Zhu M L, Gong L, Zhang L L. Soil enzyme activities and their relationships to environmental factors in a typical oasis in the upper reaches of the Tarim River[J]. Environmental Science, 2015, 36(7): 2678–2685. Czimczik C I, Masiello C A. Controls on black carbon storage in soils[J]. Global Biogeochemical Cycles, 2007, 21(3): 1–8.